Prime Minister, By sharing an amazing secret with the people of India, you can put India on the path to prosperity and ensure a comfortable victory in 2014. Allow me to share a good idea with you. By sharing an amazing secret with the people of India, you can put India on the path to prosperity and ensure a comfortable victory in 2019. What’s more, you will also fulfil your promises — job creation, doubling farm incomes and returning the wealth stolen from Indians. The amazing secret is that India is a rich country even though many Indians are poor. But all Indians are wealthier than they know. You have to tell them that the wealth they don’t know they have is controlled by the government, which behaves as if it owns the wealth. If this wealth were returned to the people, the rightful owners, it would eradicate poverty and put India on the path to prosperity. This is “Dhan Vapasi”. Every Indian, rich or poor, has a right to get back an equal share of this wealth which is public wealth – land, PSUs, minerals. This wealth comes to ₹ 50 lakh per family. Under Dhan Vapasi, every family will start getting back ₹ 1 lakh per year. You can make the first instalment happen in the 12 months you have before the first vote is cast, and thus go down in history as India’s First Prosperity PM – the one who truly made all Indians rich. I know there are a lot of questions – how can it be done, why has no one done it before, how will you persuade people that this is different from the ₹ 15 lakh promise, and so on. Some of these questions are addressed below, and others will be answered in future columns. Look forward to your making Dhan Vapasi a reality for all Indians. 1. What is the difference between private and public wealth? 2. 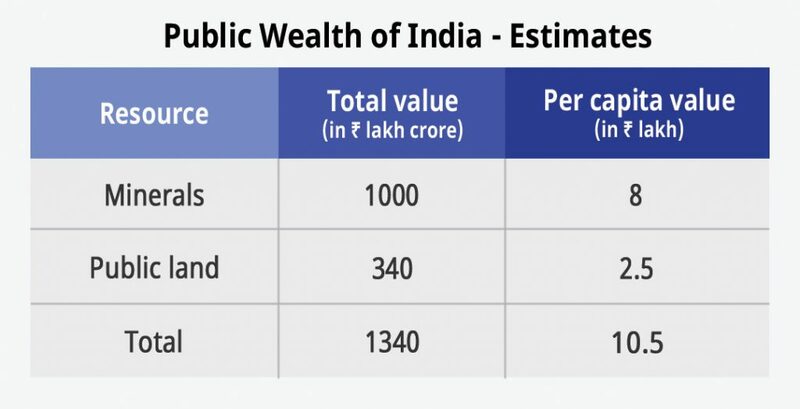 What is the estimate for the public wealth of India? 3. Whom does the public wealth belong to? 4. How will the ₹ 1 lakh per family per year help people? 5. What is the government doing with the taxes it collects? 6. How will Dhan Vapasi give back the public wealth to the people? 7. How will Dhan Vapasi change India? 8. Why has Dhan Vapasi not been done, if it’s such a good idea? 9. What will force those who are in power today to return the wealth to the people? 10. How is Dhan Vapasi different from Modi’s ₹ 15 lakh promise? Our private wealth is what each of us owns — property, our money savings in banks, etc. Different people have different amounts of private wealth. The rich have more, and the poor have little or none. Our public wealth is all the wealth that is collectively owned. That is everything that is not privately owned by individuals or private corporations. It includes land, the minerals within it and all improvements on it, public sector corporations, road and rail networks, and so on. The public wealth belongs to the public. It does not belong to the government. It does not belong to the politicians and the bureaucrats. Therefore, the public must benefit from the public wealth, not the government. Unfortunately, the people in government behave as if that wealth belongs to them, and they can do whatever they feel like doing with it. Here is an illustration to clarify this point. Imagine that there is a bank in which your ancestors put their savings over the generations. The money in that account actually belongs to you, your family and your descendants. That also means that the interest on the account should be yours to use if you need it. But if the bank manager uses it as his own money and refuses to let you use the money when you need it, it would be theft and you will resist it. It will give millions of the currently poor the financial foundation to engage in productive activities and also the ability to increase their personal consumption — food, clothing, shelter, education, healthcare, etc. That increased consumption will lead to greater demand for goods and services, which in turn will lead to job creation and therefore incomes. It will be the start of a virtuous cycle of production and consumption. The government, which was supposed to be the chowkidar of the public wealth, has instead become the owner, the zamindar. Instead of safeguarding the people’s interests, which is its job, the government has become their master, dictating to them how much they have to pay it to do the job of ruling over them. While some amount of taxes are necessary for the essential job of governance — which is to ensure domestic law and order, and national defence. But the government takes much more than that. Part of that is used to buy votes by bribing some people with goodies that are not given to everyone. And part of it is wasted in running loss-making businesses — even though the government has no business to be in business. This must stop. The simple answer is that the government controls assets that can produce wealth but which the government mismanages, or does not even put into production. Much of public land, for example, can be put to better use. That would generate wealth that will be like the “interest” that can be distributed to the public on a regular basis. All families will be given equal shares of the public wealth thus generated. There will be no discrimination. The land that the government controls but does not use, or misuses, will be brought into production. This would provide ₹ 10 lakhs per family. The government will withdraw from all businesses. This will stop the losses that are paid for by us, and it will expand the economy — more jobs, more production of goods and services. And this will generate an additional ₹ 5 lakhs per family. The mineral wealth of India is estimated at over ₹ 40 lakhs per family. Half of all Indian families earn less than ₹ 10,000 per month. That is around 13 crore families. All families will have increased income with Dhan Vapasi but the incomes of every poor family will at least double. ₹ 1 lakh per year is a large amount for them. They will be able to buy more food, more clothing, more education, more healthcare — all kinds of things they cannot afford now. This will increase demand for goods and services — which in turn will generate more jobs that the people need. Since every family will have an increased income, the ability to pay for more food will benefit Indian farmers. Farm incomes will more than double. With more money to spend, the entire economy will get a boost from an increase in demand for all goods and services. Consider an illustration of this effect. Suppose there is a large piece of fertile land but is not cultivated. Also suppose there are people who are willing and able to produce food but are not allowed to farm on that land. If the people are given use of the land, they will have jobs, and there will be an increase in food production. That is a benefit to the people without imposing a cost on anyone. Dhan Vapasi is about getting wealth back from control of the government and stopping it from wasting people’s money. It is about giving wealth to everyone without the need to take any wealth from anyone. It is a win-win mechanism. It is not redistribution of wealth. It is not taking wealth from someone to give to someone else. The answer is that Dhan Vapasi benefits everyone except those who are in control of the public wealth of India. Dhan Vapasi is not good for them. They are the politicians and bureaucrats in power, and it is against their private interest to return Indians the public wealth. There is only one way — Indians have to vote for a government which promises Dhan Vapasi. Which means, if sufficient number of voters choose Dhan Vapasi, then it will happen. Modi’s 15L idea was about “black money” that is supposed to be hidden in foreign banks. It was not clear how that money was supposed to be recovered, and how it was to be distributed. Maybe there’s black money abroad but the government really has no means to get it back. Dhan Vapasi is about real wealth that exists in India. It does not require anything other than the will and determination of the people to get that wealth. Dhan Vapasi is not just about returning what is rightfully owned by the people, but also creating a system that actually creates more wealth for everyone, without taking any wealth from anyone.